We may think dharma is learned from books and meditation practice, but, according to Judy Lief, the most powerful teachings come from relationships. Since the time I first encountered the dharma, I have found that my most intimate personal relationships—with my teacher, my husband, my parents and my children—have been my most powerful teachers. 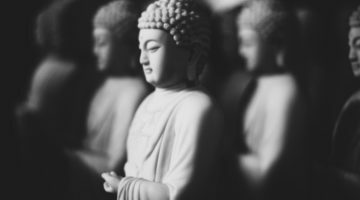 In books, Buddhism can seem abstract and coldly rational. My experience is that relationships, not words, are the basis of the Buddhist journey. In a discussion of spirituality with a group of formerly homeless people, one of the participants put forth this view most eloquently, saying, “What spirituality means to me is my relationship with all living things.” We are within a web of relationships from the moment we are born, and even in solitary retreat we carry our pattern of relationships with us. Of all these relationships, the most provocative and transformative in my own life has been my relationship with my teacher. When I met Chögyam Trungpa Rinpoche I had not read a single book he had written and my knowledge of Buddhism was rather thin. I have virtually no memory of the content of the first talk I heard. It was not what Trungpa Rinpoche said but how he was that I noticed. When a grasshopper jumped on to his hand in the middle of his presentation, rather than shooing it away or even being startled, he broke into a smile. He took a real interest in the grasshopper and examined it slowly and carefully. After some time it flew away and he proceeded with his talk. During the course of the weekend, I noticed that same quality of delight, interest and presence in all his interactions. Trungpa Rinpoche was continually creating relationships, constantly interfacing with the people around him. These personal encounters—whether the briefest of interactions, friendly socializing or love affairs—inspired many students to begin to practice and study the dharma. Through these many and varied interactions, Trungpa Rinpoche was able to teach the dharma in accord with the style and understanding of each individual student. 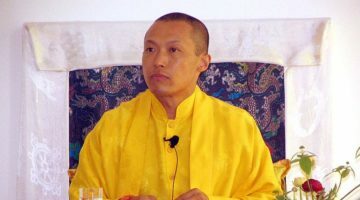 It was my personal connection with Trungpa Rinpoche that inspired me to become a dharma practitioner. No amount of study, no amount of reading, could have changed my life in the same way as meeting Trungpa Rinpoche did. A few weeks after I met him, I packed up all my books and put them on the sidewalk outside Hunter College with a big sign on them: “Free Books!” They were snatched up by happy students within minutes. Shortly after, I dropped out of graduate school and moved to Boulder to be closer to my teacher, to deepen my understanding of Buddhism and to enter more fully into the path of meditation. At the time, that decision seemed completely choiceless, a no-brainer, obvious. I had met a teacher I trusted and respected and I longed to connect further. I did not hesitate. It is risky to enter into any relationship, and there are many good reasons we should think twice. Yet in many spiritual traditions it is thought that genuine teachers should connect directly with their students, heart to heart, that they should love their students without holding back. If a teacher really cares about students as friends, if there is a heart connection and if the students truly trust and love their teacher, that mutual trust creates an atmosphere ripe for teaching and ripe for absorbing the dharma. The Tibetan tradition is filled with examples of powerful spiritual relationships, and pivotal encounters between practitioners and people they meet along the path—friends, lovers, teachers and even strangers. In the sutras, the teachings are conveyed dynamically, in the form of dialogues between the Buddha and his students. The teachings of the Buddha are transmitted in the meeting of a particular group of students with a particular teacher in a particular setting. And all along the path, as students ripen and mature in their understanding, they are provoked, guided, inspired and awakened by the personal encounters they have along the way. Countless intimate moments coax practitioners to dare to go forward on their journey. Whether a practitioner encounters reality directly in the form of a teacher or through someone else, a relationship is established and the practitioner is drawn out of himself or herself—at times gently and at times abruptly. Relationships bring the dharma from the head to the heart, from the theoretical realm of ideas to the reality of how we actually deal with one another as human beings. The dharma gets personal. The image of student and teacher as lovers has appeared over and over again in many different cultures. The student as lover seeks out and seduces the teacher, the beloved, to transmit her or his knowledge and understanding. A good student seeks out the teachings as a bee seeks nectar. Likewise, when a teacher meets students who are ripe to learn, he or she does not hesitate to engage them fully and connect with them directly. The teacher is willing to fall in love with his or her students, to enter into their world completely. At the level of the heart connection, mutual passion links the teacher and disciple. The heat of passion, the warmth of affection, links the teacher and student even when they are physically far apart. If they are in the same room, a mere glance may ignite this connection, and when they are apart, it is as if they were joined by a golden thread. 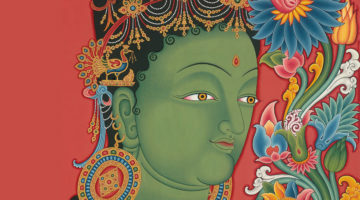 In Tibetan iconography, this relationship is shown in a hidden way through symbols. For instance, a deity may embrace a staff, symbolizing that deity’s continual union with his or her consort. Symbolically, one’s lover is always with one. Subtler still is the mind connection. At this level there is a complete mixing of minds between guru and student. Both are completely open, with no filtering, no resistance, no hesitation. Therefore the teachings can be conveyed in an unsullied way, without the need for words or gestures. The dharma does not need to be dressed up; it is the naked truth. In Tibetan iconography, physical nakedness symbolizes this naked unbounded state of mind. Here the meeting of guru and student is immediate and at the same time complete. There is absolutely no need for embellishment. The guru-student connection sets an example for how we might work with our other relationships in such a way that instead of serving as entertainment or distraction, they push us or pull us to awaken. The relation of teacher and student can serve as the starting point for developing greater heartfulness, openness of mind and awareness in all our important relationships. The Buddha set out on his own spiritual search alone, having abandoned his family and left behind his familiar world. He dropped the trappings of wealth and privilege and set off as a nobody, not as a prince with his retinue. Having escaped from the protected cocoon of courtly life, the Buddha replaced his old lifestyle with a new one, that of the wandering yogi. He entered into a period of intensive study and rigorous practice, working with a variety of leading teachers. 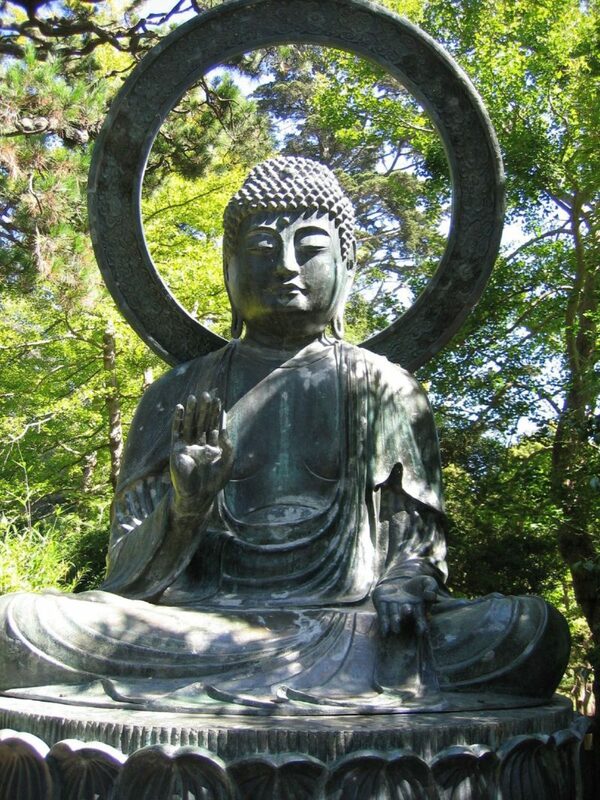 In the end, when he had completed his studies, the Buddha reconnected with his own family and friends and established relationships with countless people throughout the region, both male and female, powerful and weak, of all castes and classes. He had discovered a middle way, free from attachment to either worldly or spiritual identity. And from this open ground, he taught and reached out to all sorts of people throughout his life. But this step of leaving home and giving up parental figures does not mean rejecting your parents or avoiding relationships. Leaving home does not mean simply replacing one home with another, or an old set of friends with a new set of friends. It is about letting go of our habitual attachments and expectations. Many of our relationships are burdened by expectations, desires, hidden fears and unquestioned assumptions. The possibilities are endless. Some of us want to be taken care of; we seem to be in a perpetual search for the perfect parent. Some of us want to be in control; we seek out those we can overpower. Some of us feel empty; we seek to gather in friends to cure our loneliness. Some of us don’t want to be bothered or hassled; we want to be left alone. Maybe we have been hurt, so we don’t want to get involved and let ourselves be hurt again. In order to loosen the hold of such patterns, first we need to see them clearly. In relating with the teacher, we try one stratagem after another, hoping that something will stick. But we find that nothing works—that a genuine relationship is not about strategy or trying to make something happen, or about gaining approval or avoiding disapproval. Relating with a teacher is provocative because it exposes our own particular neurotic patterns and mirrors them back to us. Usually if two people are relating, both are contributing their own projections and distortions and it is very hard to see past that. But when you relate to a teacher, your own distortions stand out with great clarity. The teacher embodies openness, freedom and sanity, as opposed to self-protectiveness, fear and fixation. As such, the teacher serves to heighten the contrast between loving relationships that entrap us and love that draws us out of ourselves on to the path of awakening. Letting go of our projections and preconceptions, we find ourselves in relationships that are open and uncapturable. This can feel incredibly fresh or incredibly intimidating or both at once. Any notion that our relationship has to be a certain way, in accord with our wishes rather than the way that it actually is, falls away. What is left is raw and direct. We are left with our heart exposed and nowhere particularly to go. There is very little to hang on to, neither a solid sense of who we are nor who the other person is. There is nothing to figure out. This open ground is the home to which we return. And from this ground we can see people with new appreciation. This shows up in so many ways. Sometimes even a slight loosening of the many ideas and assumptions we have about those we care for opens us to qualities in them we never noticed. We tend to diminish ourselves and others tremendously, and it is very hard to take a fresh look. The journey of leaving home—examining our patterns, dropping them and returning to open ground—is what I see as the journey of relationships. I used to think that I should try to develop some more perfect way of relating, one that would involve no pain. Compared to this ideal, my actual relationships could not measure up. However, through the teacher-student relationship, I discovered that underlying every relationship is the experience of open ground, free from attachment or rejection, where such measurements are irrelevant.